A study of surface features on Ceres as revealed by NASA’s Dawn spacecraft indicates the dwarf planet experienced cryovolcanism in its past, with individual ice volcanoes having spewed large amounts of material onto the dwarf planet’s surface. In 2015, Dawn discovered Ahuna Mons, a lone mountain and dormant ice volcano with a height of 3 miles (4.8 kilometers). While it is no longer erupting, the mountain is no older than 200 million years and likely was active in Ceres’ recent past. 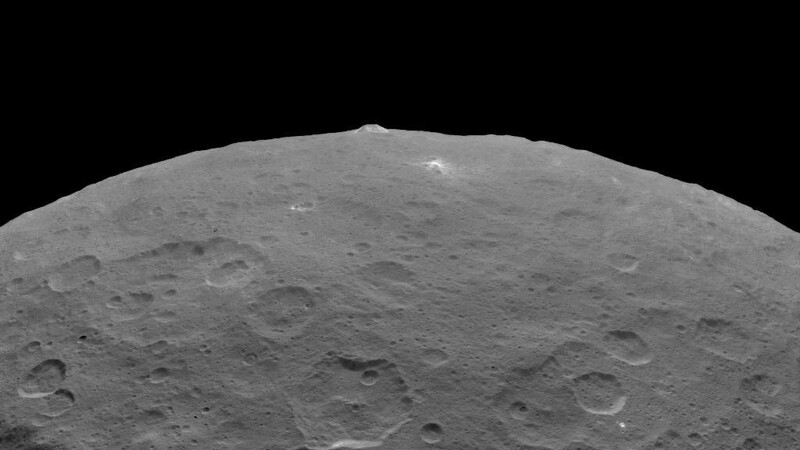 Scientists were puzzled by the presence of just one mountain on Ceres’ surface. In an effort to find evidence for additional cryovolcanoes in its past, Michael Sori of the University of Arizona’s Lunar and Planetary Laboratory led a team of scientists in an observational search for the dwarf planet’s missing mountains. Sori and fellow researchers were especially interested in comparing cryovolcanism on Ceres with that on outer solar system objects and with regular volcanism on terrestrial planets. “There was a great deal of interest in searching for cryovolcanoes on Ceres as soon as Dawn arrived there because thermal models had predicted they might exist,” said Hanna G. Sizemore of the Planetary Science Institute, who took part in the study. “Ahuna Mons was a great candidate right away. I carried out a global search that identified 31 other large domes, based on analysis of Dawn’s Framing Camera images and topography data. Making the case that they were volcanic was difficult because they were more ancient than Ahuna, and the surfaces were heavily cratered. 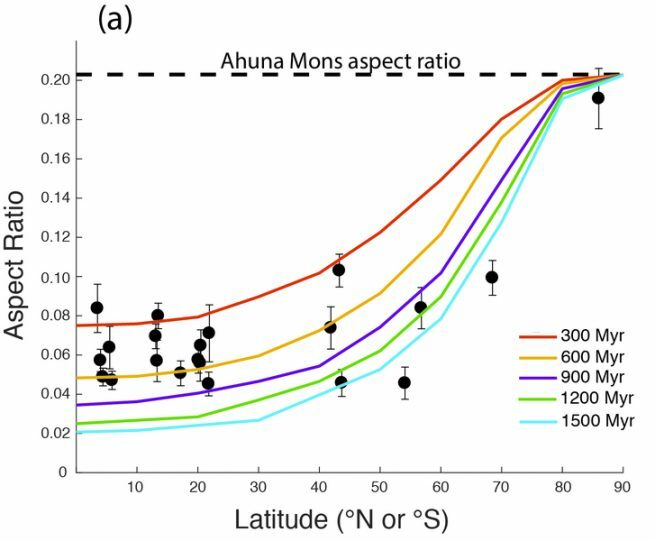 In this study, we were able to compare the shapes of the mountains to numerical models of how they should relax over time if they were made out of icy lava. That strengthened the case that they were volcanic features and let us make comparisons to volcanism on other planets,” Sizemore said. Unlike rock, viscous materials, such as ice, flatten over time. This process causes ice to flow in a manner similar to the way glaciers flow on Earth, flattening and relaxing the mountains over time to the point of concealing their existence, Sori said. Ice flows faster in higher temperatures. Computer models that simulated conditions throughout the dwarf planet’s 4.5-billion-year-old lifetime suggested that volcanoes closer to Ceres’ equator were initially tall and steep but rounded, flattened and shrank over time. In contrast, the models showed that cryovolcanoes at Ceres’ poles did not relax but remained frozen in place. Temperatures on Ceres’ surface vary but never exceed minus 30 degrees Fahrenheit (minus 34 degrees Celsius). 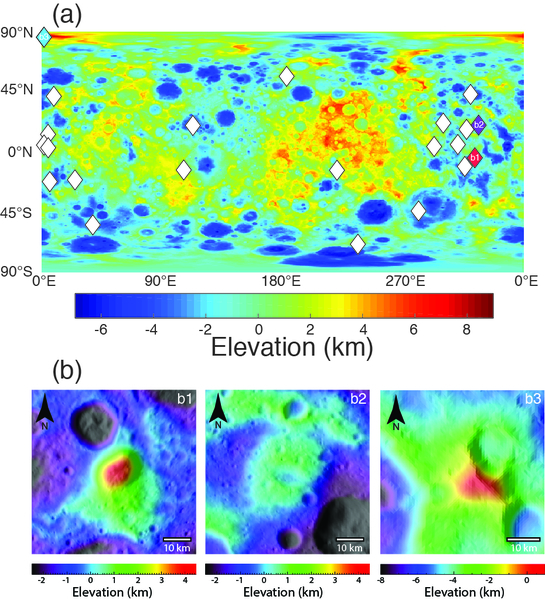 Observation of Ceres’ topographic features as imaged by Dawn confirmed the findings of the simulations, revealing 21 mountains in addition to Ahuna Mons that matched simulation findings. One of the researchers’ discoveries is an old polar mountain named Yamor Mons, which has a shape similar to that of Ahuna Mons, approximately five times wider than it is tall. This gives it an aspect ratio of 0.2. As the computer model showed, mountains further from the poles have lower aspect ratios, meaning they have diameters much larger in comparison to their heights. “We measured the height and diameter of 22 domes and from this calculated the aspect ratio and volume of each. We assumed that they all started out sharply peaked like the youngest mountain, Ahuna Mons. We then calculated the time it would take them to flatten to their current shape, using a numerical model of viscous relaxation. This allowed us to assign approximate ages to the majority of the domes, cross check the model ages with other constraints, and approximate the rate at which the domes formed over the past one billion years. Having the volumes of the domes and the rate of formation on Ceres, we could then make direct comparisons to other worlds,” Sizemore said. The researchers calculated that a volcano forms on Ceres’ surface approximately once every 50 million years, erupting the equivalent of more than 13,000 cubic yards of material per year. In contrast, volcanoes on Earth erupt more than one billion cubic yards of material each year. Instead of lava, eruptions on Ceres consist of a mixture of rocks, ice and volatiles such as ammonia, which freeze on the surface. Finding cryovolcanism on Ceres, which scientists expected to be a dead world, suggests the dwarf planet may be similar to other solar system worlds on which cryovolcanoes have been observed, such as Jupiter’s moon Europa, Saturn’s moon Enceladus and both Pluto and its moon Charon. Scientists suspect these worlds either have subsurface oceans or once had subsurface oceans that later froze. Ceres may also harbor an underground ocean or may have had one in its past.